Dale Scott was carted off on a stretcher after a foul ball head injury sustained during Friday's Orioles-Blue Jays game in Toronto. With none out and none on in the top of the 8th inning, Orioles batter Mark Trumbo fouled a 95.4 miles-per-hour cutter from Blue Jays pitcher Ryan Tepera into the middle portion of Scott's traditional-style facemask. Scott was replaced behind home plate by 2B Umpire Brian Knight, while base umpires Jim Reynolds (1B) and Lance Barrett (3B) shared the field for the rest of the contest. 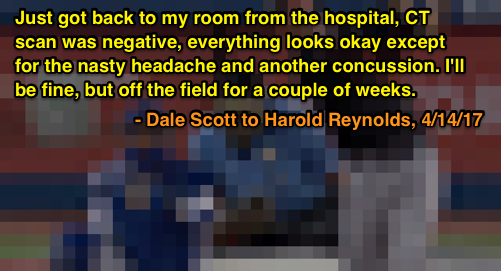 Relevant Injury History: Prior to Friday, Dale Scott's most recent game-ending head injury was a similar foul ball to the facemask event, sustained on July 16, 2016 on a foul ball from a 91-mph fastball during the first inning of that day's Dodgers-Diamondbacks game. Scott also experienced a foul ball injury during a Mariners-Jays game on August 7, 2013. 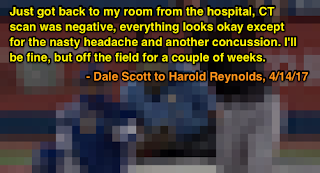 The minimum amount of time a player or umpire may be placed on the concussion list is seven days; Scott was absent for a total of 16 days following his July 16, 2016 head injury; he has not officiated over 108 games in the regular season (a full-time MLB umpire generally officiates about 120 games during the regular season) since 2014. Just got back to my room from the hospital, CT scan was negative, everything looks okay except for the nasty headache and another concussion. I'll be fine, but off the field for a couple of weeks.